This article was published on 06.08.17. 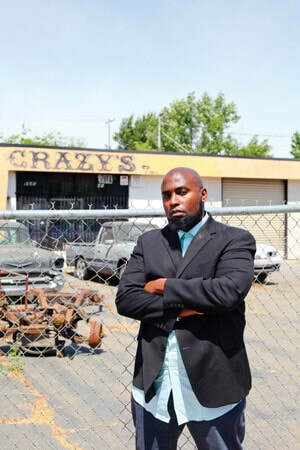 Malaki Seku-Amen strode down Balsam Street in Del Paso Heights, decaying couches on one side and an abandoned auto shop across the way. He used to live a block from here. When he was 8 years old, his mom received public assistance before becoming a nurse. Seven years ago, he returned. Nothing changed. “That’s what gave me my epiphany: Far too many residents in neighborhoods like this don’t get the opportunities my mother did,” Seku-Amen said. After directing lobbying for the California NAACP, attending Harvard and creating economic strategies for the California Black Caucus and Gov. Arnold Schwarzenegger, Seku-Amen became CEO of the California Urban Partnership. He works to improve economic security in communities of color. His latest aim? Using marijuana regulation to bring economic justice to communities victimized by the prosecutions of the drug war. Cities and governments are trying to cash in on pot regulation. What’s your role in this process? The Urban Partnership got involved with pushing for equitable policies in this growing marijuana industry because there’s a history of how the war on drugs has devastated families and communities of color. The typical story is a parent who was locked up can’t get housing, a job or tuition, because of a record. Children in Del Paso Heights, South Oak Park, Meadowview, suffered from long-term underinvestment. That’s why we see vacant lots, boarded up, substandard properties and housing. We got involved to prevent the transfer of wealth from an underground economy into the hands of rich, white investors without addressing the impacts. … We’ve brought together over 25 organizations, leaders and activists to work with us to move this forward. It’s drug war reparations—that’s what we want. What should city leaders do differently to bring that equity? We’re asking for three things as marijuana regulation gets rolled out in the city of Sacramento: We’re asking for data on what the marijuana arrests have been along the lines of race and ethnicity—we already know over 50 percent of them have been African-American, second is Latino; we want there to be equity in terms of who gets licenses to do business; thirdly, we want the tax and the fee revenues to not get lost in the general fund. We want the tax and fee revenue to be directed to economic development, affordable housing, job training and programs for young people with an emphasis on drug prevention and life skills. We’re past the second meeting with the city. … We’re making progress, but there’s still a ways to go. … We’re hoping to send a proposal to the legislative committee in a couple months before the council takes it up. Would the growth only come from marijuana businesses? We don’t want to have property values drop because of marijuana businesses. That’s not the highest value for properties in these areas. … We want the industry to have diverse participation, but it lends itself to supporting other business growth opportunities in the neglected areas we care about. We would like to identify small businesses, entrepreneurs of color, and have started to profile them on Arize.org, our community resources site. We’re focused on food business incubation, construction business clusters and technology entrepreneurs. Ideally, we would like to see these resources and the wealth from marijuana and other sources of funding support these projects. Looking back from where you are now, what words of wisdom would you give to your 8-year-old self? Dream big. To understand that every action you take is going to lead to the result you want to see. To be the change you want to see in the world. It’s totally within your grasp and your abilities. All you have to do is paint that picture that you want to see. And see yourself inside that picture. It’s OK to be afraid. Fear can make you stronger and more determined. You were once second place as Mr. Black Sacramento. What was that like? We need to see strong images of black men as successful entrepreneurs, as doctors, as lawyers, as superheroes on TV. I love Superman, I love Batman, but I’m like, damn, can I see myself as a superhero? I gave a speech in front of the community about the importance of education. I was also working on Sacramento’s first black business directory at that time. And I sang. My friends and family were there and the newspaper covered it. It was awesome to be uplifted and supported by a community. It was an incredible boost. What’s your No. 1 priority in life now? Living up to my name: Being a messenger, a warrior for life, for truth, for love and the ability to create prosperity. Malaki is Hebrew, loosely translated it means “messenger”; Seku is a West African name, which loosely means “defender,” “warrior”; and Amen is also Hebrew and is an affirmation of what is good.